Polyester – Hypoallergenic and machine-washable, polyester fiber holds its shape well and is the most budget-friendly filling. Down/feather – Down pillows do a good job of conforming to your head, shoulders, and neck for springy support. It’s a long-lasting and breathable natural material. Memory foam – These pillows are good for neck support, molding to your shape as you move. A new foam pillow may initially have an unpleasant odor, but leave it out to air and it will fade. Latex – Resistant to bacteria and dust mites, latex is a good choice if you have allergies. The best support comes when your head rests in neutral alignment – that is, keeping your head squarely in line with your shoulders so your spine isn’t bent. 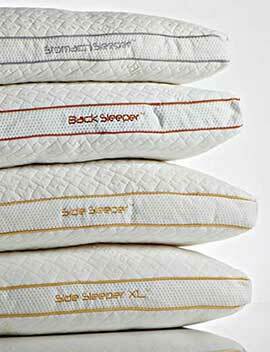 Side – Side sleepers need firmer pillows to support the neck and head to keep them in alignment with the spine. Back – A medium-support pillow will give you comfortable cushioning that’s not too high. Stomach – Soft pillows are best so they don’t place undue strain on the neck or lower back. You may not even need a pillow for your head, but tucking a thin one under your hips can help avoid lower back strain. You may find you need more than one type of pillow, or a pillow designed for multiple-position sleepers. They’re also sold in a variety of sizes. Standard pillows are 20 x 26 inches, but depending on your body frame, you may find you’re more comfortable with a narrower or longer pillow. If your pillow has gone flat, it’s no longer giving you any support and it’s time to be replaced. Old pillows also tend to contain skin cells, dust mites, or mold and mildew. Wash pillows (or the pillow protector in the case of memory foam pillows) regularly to increase their life. After 2 years, it’s time to toss them. Your pillow is responsible for 20% of your spinal alignment. With the right support you’ll notice the benefits of quality, healthful rest.